Inaugurated in June 2006, the museum occupies an area on the right at the back of the abbey complex. The museum is practically under the tower and is organized into a large hall that, until a short time ago, served as the monastery’s typography, the so-called “treasure” room, and a small but well-supplied bookshop. This is not, however, the first structure of its type at Vallombrosa. Already in the 18th century, the abbey had its own museum, albeit very different from the current one. The collector and organizer of that first museum collection, which occupied more than five rooms, was Father Lotario Bucetti, the abbot from 1791 to 1792. Earlier, between 1788-1789, he had assembled, with truly encyclopedic passion, a heterogeneous assembly that—at least in the beginning— could be defined as a natural history collection because of the extensive presence of rare and curious animal and botanical items, archeological finds, fossils, and a small section of works of art that had also been acquired on the market. The principles inspiring Father Bucetti were those that governed the late Renaissance and the 17th-18th century fashion for creating wunderkammern (cabinets of curiosities), which were often also housed in convents. 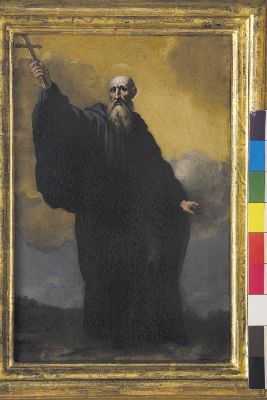 However, the museum did not have a long life: Father Lotario’s transfer to the abbey in Pistoia and a gradual loss of interest by the remaining monks led to its rapid decline, with the collection being almost completely dispersed following the 1810 French monastic suppression. Monastery of Santa Trinita in Florence. 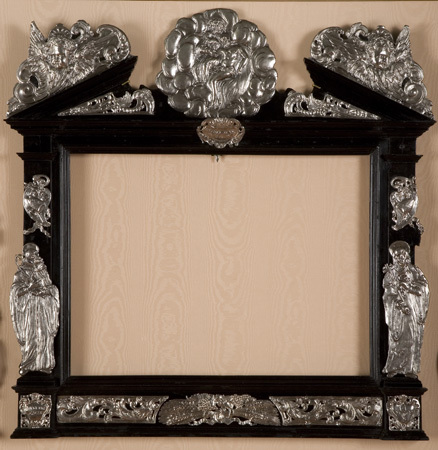 The large hall displays a sampling of various “treasures” in elegant and beautiful cherry wood display cases whose traditional typology has been re-adapted on a technical level. 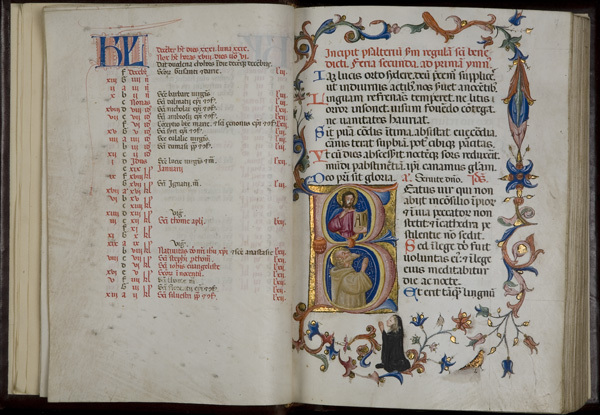 Here we find sacred hangings and vestments, a selection of paintings (those belonging to the abbey are exhibited on a rotating basis), books, illuminated codices, everyday objects such as majolica pieces, and ancient missals. 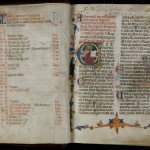 Finally, there is the collection for which the abbey is justifiably famous, an important series of scagliolas. 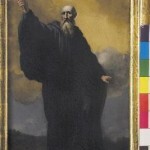 It was the abbot himself, Father Enrico Hugford, who brought this art to its maximum splendor at a European level in the 18th century, leaving proof here of his unique artistic activity. We must however point out the two absolute masterpieces stand out in particular, both of which have been returned to the museum since it re-opened. They had been removed in the 19th century following the previously mentioned suppressions. 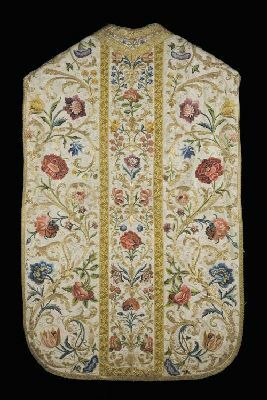 The first of these is the very famous Altoviti Set of vestments (15th -16th centuries), made up of a frontal, two tunicles, and a chasuble—their fabrics themselves already much admired—whose magnificent embroideries were carried out based on designs by the great masters. No less outstanding is the large altarpiece with the Madonna with Child and Four Saints by Domenico Ghirlandaio and his assistants, which has been returned to its original splendor with enameled colors after a long and complex restoration. Both works have been loaned by the Florentine Galleries, which acquired them in the 19th century. In the adjacent Treasure Room, prized liturgical furnishings from the 14th-20thcenturies have been collected. 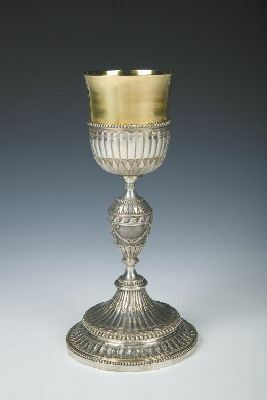 There are many beautiful chalices (one of which belonged to Father Lotario), reliquaries in glass or gilded carved wooden (like the ones of Saint John Gualbert), monstrances, and other silverworks. 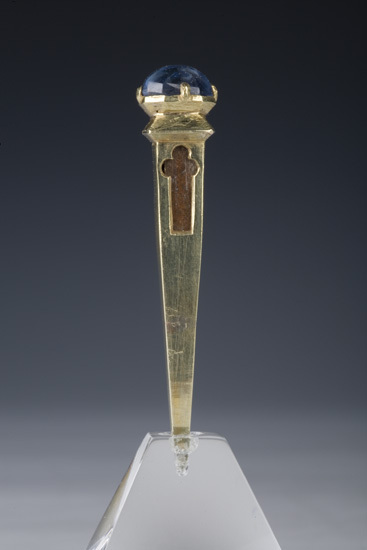 One of the more fascinating objects is the ancient nail-shaped Reliquary in gold, enamel with a single sapphire. Undoubtedly, the most important piece is the large and much cherished Reliquary of Saint John Gualbert’s Arm in silver and enamels, commissioned by Abbot Biagio Milanesi to the famous goldsmith Giovanni Sogliani who created it in the year 1500. Vallombrosa nel IX centenario della morte del fondatore Giovanni Gualberto 12 luglio 1073. AA. VV. Firenze, Editore: Giorgi & Gambi, 1973. 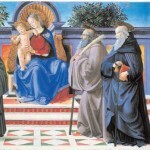 Il Ghirlandaio di Vallombrosa. Un restauro difficile, un ritorno trionfale. Caneva C., Firenze, Editore: Edifir, 2006. Vallombrosa. Santo e meraviglioso luogo. Ciardi R. P., Pisa, Editore: Pacini Editore – Banca Toscana, 1999. Size: 300 mm. x 220 mm. 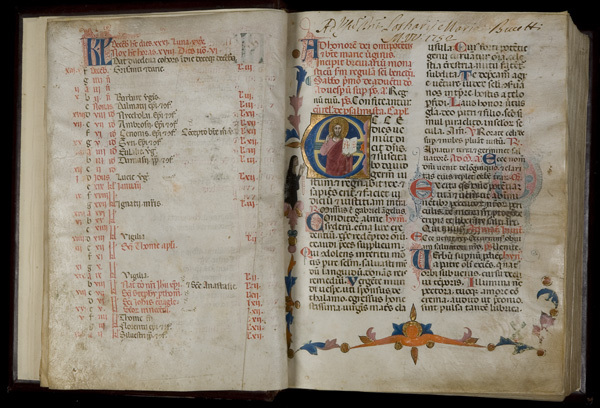 The book was donated to Father Lotario Bucetti in 1752 by one of the Benedictine nuns from the Church of San Pier Maggiore, which was later destroyed at the end of the 18th century. The rich decoration presents the initial letters in red and azure, groups of letters in brown ink painted with a yellowish watercolor, lozenges, inflorescences, animal heads, human figures, filigreed letters, with botanical, figured and illustrated decorations. Size: 75 cm. x 72 cm. 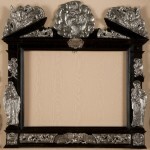 At the sides are the silver figures of Saints John Gualbert and Humility, with the Trinity and the dead Christ above. In the center of the cartouche is the inscription: ECCLESIAE SS. TRIN[ITATIS]/ FLORENTIAE. It is from the late Baroque period and, together with two smaller ones, was inspired by print prototypes from the first half of the century. Size: 16 cm. x 13 cm. 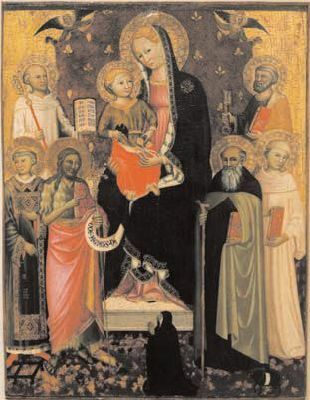 The small painting comes from the destroyed Church of San Pier Maggiore in Florence and must have been acquired by or donated to Father Lotario Bucetti, the confessor of the Benedictine nuns of that church’s convent. He brought the work to the monastery when he became the abbot of Vallombrosa. In that same period, numerous other works of art supplemented the nascent museum. 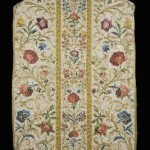 Size: chasuble: 120 cm. x 65 cm. ; stole: 240 cm. x 20 cm. 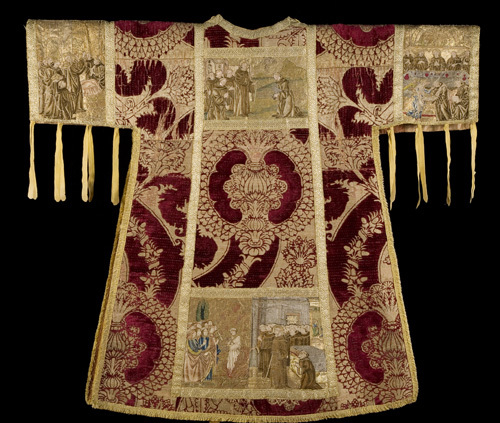 ; maniple: 96 cm. x 20 cm. ; burse: 27 cm. x 27 cm. 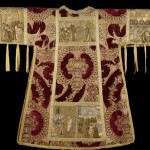 The vestment set also includes a stole, maniple and burse which are not shown here. 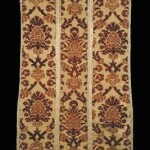 The pattern has the classic “mesh with two types of thistle flowers” motifs. 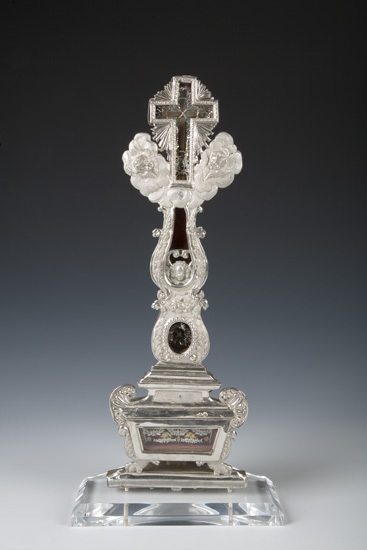 According to the inscription, this reliquary contains a fragment of a nail from the Cross. 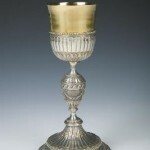 It was concealed inside the reliquary of the Holy Cross and Saints. Louis IX, King of France, donated it to Abbot Benigno of Vallombrosa, between 1226 and 1233, in exchange for the abbot having sent one of Saint John Gualbert’s hands as a holy relic. Size: 121 cm. x 132 cm. The design is made up of a sinuous trunk crossed by a twisted ribbon with acorns, coming together in a lobed leaf containing a pomegranate intertwined with a second, thinner branch. 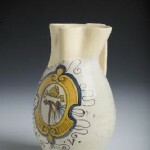 It culminates in a pomegranate topped by fleur-de-lis and encircled by acanthus leaves. The embroideries, stylistically referable to coeval Florentine painting, present precise characteristics of Italian, Spanish and Flemish workshops between the 15th and 16th centuries. Size: 150 mm. x 100 mm. 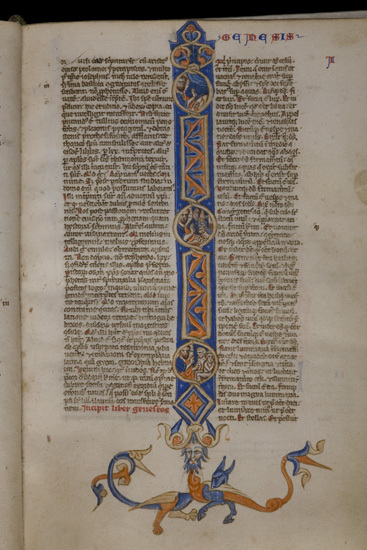 This codex is one of the most ancient and valuable of those kept in the Vallombrosa Abbey’s Archives. Rich in sharply outlined, strongly expressive small figures and animated lines of fantastic and monstrous figures, the decoration is to be assigned to the Arezzo School on the basis of comparisons to works that undoubtedly came out of Arezzo’s 13th-century “scriptorium”. This is an everyday object, with thick glazing and decorated with the Vallombrosan coat-of-arms set in a manneristic frame. It is similar to the ones carved on the lecterns, choir stalls, and period furniture or painted on faience vessels in the late 16th century. 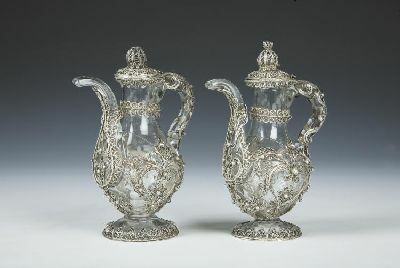 The silver displays fine embroidery that, on the sides of the ampullae, becomes a heart-shaped motif from which leaf-like decorations originate. 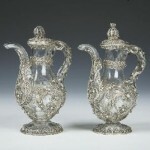 The decoration is enriched by the use of small pearls. 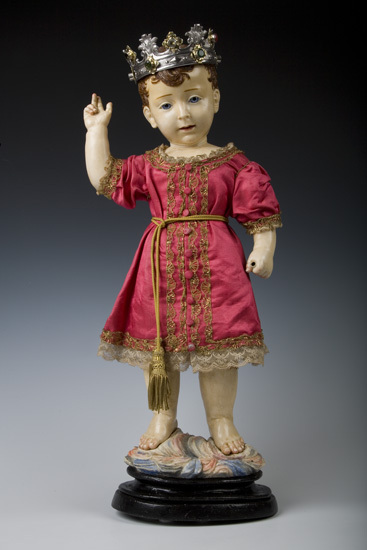 The statuette is sumptuously clothed in robes embroidered with gilded thread and bearing a crown and halo in gilded metal. 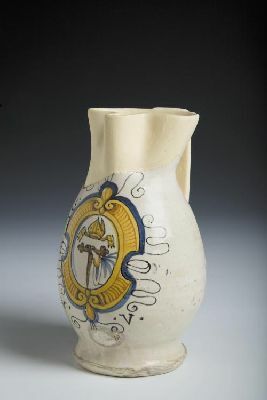 An example of Neapolitan folk art, it was given to the abbey by the noblewoman Maria Immacolata d’Avalos as a sign of her devotion. Size: 265 mm. x 190 mm. 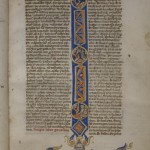 The codex, as seen by the Latin inscription that appears on the verso of folio 108, was written by the presbytery Ser Andrea, the chaplain of the Benedictine monastery that was destroyed in the 18th century. 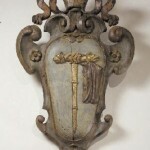 Its provenance from that monastic complex, for which Father Lotario Bucetti was the Benedictine nuns’ father-confessor, leads to thinking that it may have been either a gift or acquisition by him, who had established a personal museum inside the abbey. 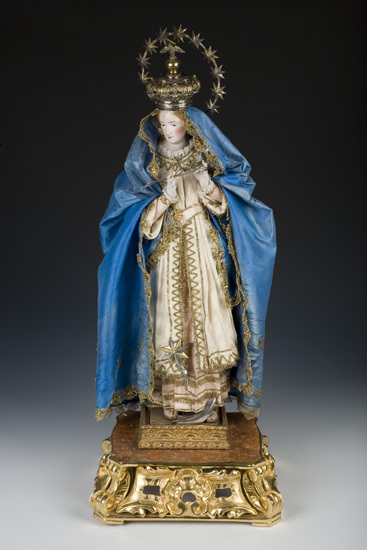 The importance of this reliquary is not due to its workmanship, a very common and recurrent type between the 18th and 19th centuries. 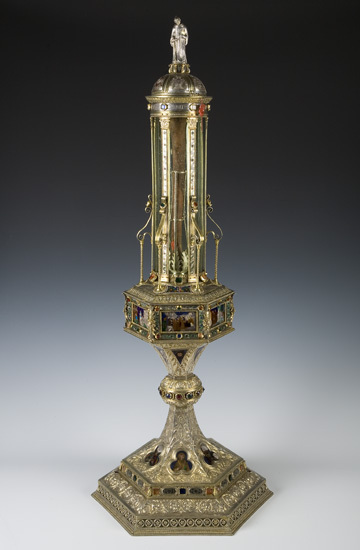 Although made of a precious metal like silver, with caskets and display windows for the various relics set among botanical racemes, clouds and cherub heads, its value is due only to having housed the 14th-century reliquary in the shape of a nail. Size: 44 cm. x 29.5 cm. The painting was acquired by the praiseworthy abbot, Father Lotario Bucetti, and was donated to the abbey in 1799. The canvas depicts John Gualbert with a cross lifted to heaven in his right hand as his left rests on a T-shaped staff, according to the traditional iconography. 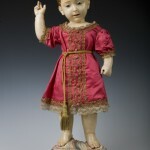 This Baby Jesus wears a red tunic trimmed with gilded lace, drawn at the waist with a gilded rope. He has a silver-plated crown on his head. His right arm is raised in the act of blessing while his left arm probably held something, perhaps a cross. Size: height 26.5 cm. ; foot: 13 cm. diam. Size: 160 cm. x 251 cm. This painting occupies the place of honour inside the museum, having only recently been returned to its original location after being taken to be restored in Florence in 1871. The work was commissioned by Father Biagio Milanesi, the abbot and general of the Vallombrosan order. 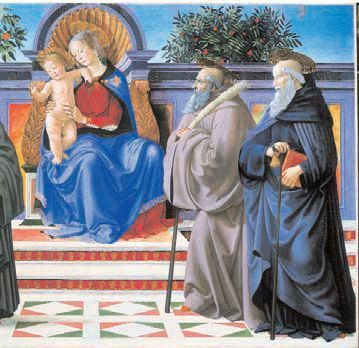 The complete scene depicts the Virgin with Child in the middle, with, from the left, Saint Blaise, Saint John Gualbert, Saint Benedict, and Saint Anthony the Abbot. Before the reliquary entered the museum permanently, the small cope was used to protect this cherished object. 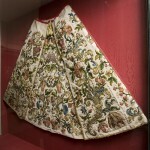 The embroideries were transferred to a more recent fabric of similar manufacture, which had evidently become shabby. Size: 116 cm. x 72 cm. 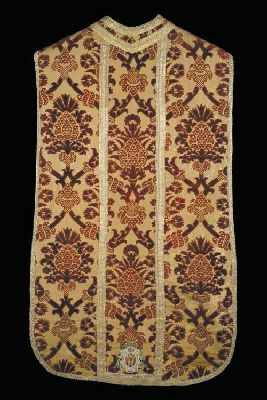 This embroidery’s motif was very widespread during the Baroque period, consisting of broad, gilded swirls from which originate vividly colored inflorescences. The choice of flowers follows a precise symbology that alludes to humanity, the Redeeming Grace of Christ, and His Passion and Resurrection. Size: height 94 cm. ; base: 8 cm. ; enameled copper panels: 7.5 cm. 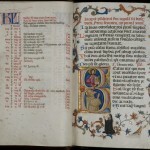 x 4.5 cm. ; trefoil enameled space: 6 cm. x 6 cm. 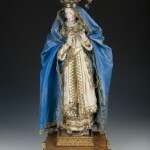 ; height and base of the saint’s statuette: 8 cm. x 4 cm. Composed of a cylindrical glass urn with the founder-saint’s forearm, this monumental silverwork is enclosed by a tempietto-shaped structure and surmounted by a statuette of Saint John Gualbert. In place of its original globe with a cross, there are six scenes with episodes from the saint’s life that are now mostly lost because of the relic’s use in exorcism practices and for popular worship. 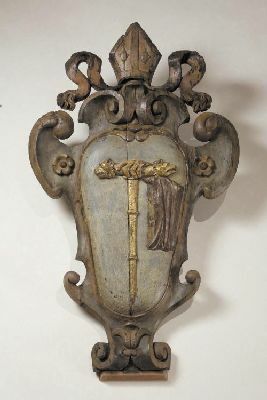 The coat-of-arms displays the symbol of a golden crutch with two lion’s heads at the two ends, against a white background. It was a sign of corrective power, and was the universal insignia of the abbots of the West although it was carried by every monk in the East. As a symbol of authority over the monastic community, the crutch remained through the centuries the prerogative of the Abbot of Vallombrosa. From Florence: along Via Aretina towards Pontassieve-Pelago-Tosi; from the railway stations in Florence or Pontassieve by SITA bus. From the Autostrada del Sole motorway: Via Incisa Valdarno – Reggello. Or exit Firenze Sud, Rosano – Pontassieve – Pelago – Tosi. From the Casentino: from the Consuma Pass, along the road in the forest, about 9 kms. Summer opening hours (from 28 June to 3 September): from Monday to Sunday, 10 a.m. – 12 p.m. / 3 p.m. – 6 p.m.